The planet Neptune is the outermost planet of the solar system, lying 2,798,310,157 miles out from the Sun - that's over 1,000 million miles further than the seventh planet, Uranus. Its orbit round the Sun takes 164.79 years and one Neptune day lasts just over 16 hours. With a diameter of 30,832 miles, it is the fourth largest in the solar system, a fraction less than its near-twin, Uranus. As you can see from this image, taken by the Voyager 2 probe in 1989, the planet Neptune is quite an attractive blue colour (similar to Uranus). This is due to the presence of methane in its upper atmosphere. This organic compound absorbs red light from the spectrum and reflects blue light. Despite the fact that both Neptune and Uranus are thought to have atmospheres of similar composition, the former's blue colour is much more vivid than the latter's. The reason for this is not known. Although Neptune is included in the outer solar system group of planets, the "gas giants", along with Uranus, Saturn and Jupiter, it is, strictly speaking, made up of water ice, rather than gas (as is Uranus). This has led some astronomers to categorise these two outermost planets as "ice giants". 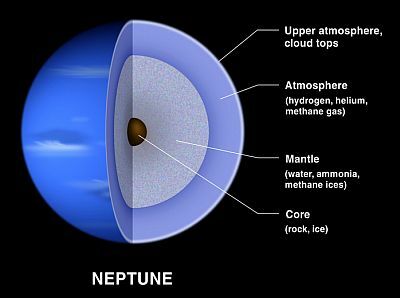 As the planet Neptune doesn't have a surface as such, its interior just consists of a mantle and core, cloaked by an atmosphere and cloud layer. The mantle is an icy mixture of water, ammonia and methane. Despite its being called "icy", near to the core its temperature can reach as high as 5,000 degrees Kelvin. Deep into the planet, the methane may decompose, resulting in crystals of diamond, which will be drawn into the core. The small core itself consists of iron, nickel and various silicates. The temperature here will be in the region of 5,400 degrees Kelvin. Observations have shown that, like Jupiter and Saturn, Neptune is giving off more heat than it receives from the Sun. This indicates the presence of some sort of internal heat generating mechanism. The usual reason for this in giant planets is that they are gradually shrinking in size. This internal heat could possibly be the cause of the planet's extremely turbulent climate. 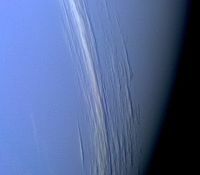 The outer layer of the planet Neptune is its atmosphere. This can be divided into four sections. The lowest layer is the troposphere, within which temperature will decrease with altitude. This layer contains clouds of various composition, according to their height. The uppermost ones are methane; deeper down, they will be ammonia, hydrogen sulphide and ammonium sulphide. At the deepest level, there are clouds of water ice. The next layer up is the stratosphere, where the temperature rises the higher you go. It contains hydrocarbons such as ethylene and acetylene, giving it a hazy appearance. The presence of these compounds accounts for its temperature increase. There are also traces of carbon monoxide and hydrogen cyanide. This eventually gives way to the thermosphere, which has an abnormally high temperature. Various theories have been put forward to account for this, but none have been conclusively proved. The exosphere is the top layer, representing the transition to outer space. The main climatic features of the planet Neptune are its winds and its storms. Neptune possesses the strongest winds in the whole solar system. They can reach up to 1,300 miles per hour, creating very aggressive weather systems. In fact, Neptune is the most meteorologically active of all the planets. This is in stark contrast to its twin, Uranus, which has very bland weather patterns. These may manifest as clouds or dark spots. The most prominent of these is the Great Dark Spot. 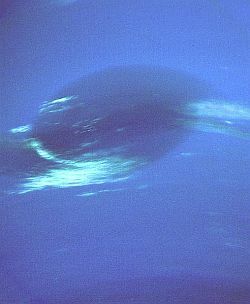 This spot was first photographed by Voyager 2 in 1989. It is similar to Jupiter's famous Great Red Spot, but whereas Jupiter's feature appears to be permanent, the one on Neptune seems, according to observations by the Hubble Space Telescope in 1994, to have disappeared. While it existed, its length was 8,100 miles and width 4,100. The planet has a whole series of these spots, however and they are holes in the cloud layer, resulting in their dark appearance. Another noteworthy storm is the Small Dark Spot, colloquially named the "Wizard's Eye", because it has a light area in the centre. 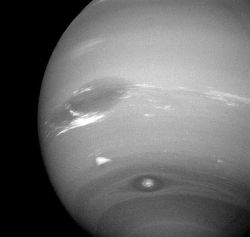 Storms can also manifest as clouds and one such is "Scooter", so named because it travelled faster than the Great Dark Spot. Like the other three giant planets, Neptune possesses a ring system. There are five main rings, but because they are very tenuous and made of dark material, they were only discovered in 1984. 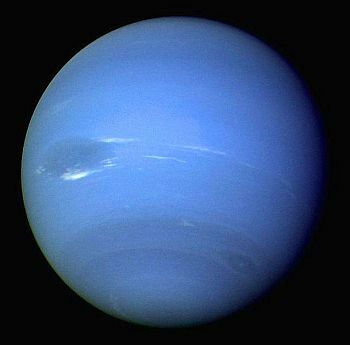 They are all named after the various astronomers who have studied Neptune in the past. In this image, some of Neptune's moons are shown too, their orbits represented by dotted lines. The Galle Ring is the innermost one, situated 25,414 miles from the planet. It is about 1,200 miles wide and is very faint, being comprised mainly of dust particles. Next out is the Verrier Ring. It is only about 70 miles thick and a small moon, Despina, which orbits just inside it, may act as a shepherd. The third one is by far the broadest. Lassell Ring spans 2485 miles and, because of this, it is also nicknamed the "Plateau". The Lassell Ring has at its outer boundary a narrow bright area only about 60 miles wide. This has been christened the Arago Ring. Finally, about 39,000 miles out, there is the very narrow Adams Ring. Displaying a width as little as 10 miles, is could have been easily overlooked, except for the presence of five bright areas arranged along it. 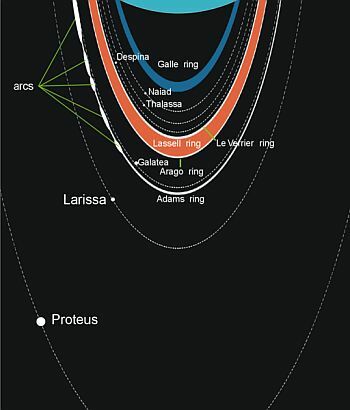 Termed "arcs", they are the reason that the ring system of the planet Neptune was discovered in the first place. They result from clumping together of the ring material. Why this clumping happens is a mystery. They've been named Fraternité, Égalité 1, Égalité 2, Liberté and Courage. There are 13 known moons orbiting the planet Neptune. By far the largest and most important of these is Triton, which, with a diameter of 1,681 miles, accounts for 99.66% of the total mass of all the moons. Its importance means it gets its own separate page on this site. The sizes of the remaining moons range from 25 to 260 miles diameters. First out from the planet is Naiad, a mere 41 miles across. Lying at 29,966 miles out, it orbits the planet in just over seven hours. Because it is so close to Neptune, its orbit is slowly decaying, so, in due course, the moon will either fall into Neptune or break up in its atmosphere. Next out, at 31,115 miles, is Thalassa. It is 51 miles across and orbits in 7.5 hours. Like Naiad, it will one day fall into the planet. The third moon, with a diameter of 93 miles, is Despina. It is 32,638 miles out and orbits Neptune in around eight hours. Yet another moon that will eventually fall into the planet. Galatea comes next, continuing the increase in size by being 109 miles across. It orbits in 10.29 hours at a distance of 38,496 miles. There have been no images so far because, in photographs taken by Voyager, they just showed up as smudges. However, these next moons have photographed rather better. Fifth moon out, then, is Larissa. It is about 120 miles across and orbits in just over 12 hours at a distance of 45,700 miles. It is the fourth largest satellite in the system and appears to be extremely heavily cratered. 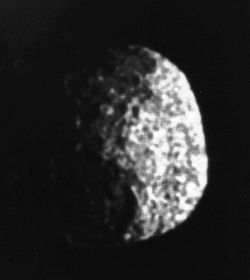 Next we come to the second largest of Neptune's moons, Proteus. It is 260 miles across and is of quite an irregular shape. Its surface is heavily cratered, the largest being about 125 miles across. It also features valleys, grooves and scarps. It lies 73,102 miles out and orbits its host planet in just over one day. Finally, we come to the mighty Triton, which marks the end of the inner moons. The next six are much more distant and spaced out. At 3,426,127 miles we find Neptune's eighth moon, Nereid. It is only 211 miles across and orbits in 360.13 days. Moving to 41,390,156 out from the planet brings us to Halimede, a mere 48.5 miles across. It has a retrograde orbit of 1879.08 days. The 27 mile diameter Sao is next, lying 13,811,839 miles from Neptune. It takes 2,912.72 days to orbit the planet. At 14,643,855 miles is Laomedeia. Only 26 miles across its orbit takes 3171.33 days. The outermost two moons are much further out and have retrograde orbits. 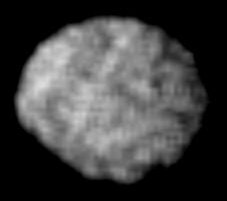 Psamanthe is 25 miles across and, at a distance of 29,885,469 miles, takes 9074.3 days to orbit Neptune. Neso is 30,736,126 miles out. This 37 mile diameter moon orbits in 9,740.73 days.